We’re occasionally asked why we’re interested in building a cloud-based directory or, as we like to say, a business focused on being the first to create a Directory-as-a-Service®. It’s a great question. Traditionally, “directories” have been solutions such as OpenLDAP™ and Microsoft® Active Directory®. More recently, organizations have been trying to leverage G Suite as a directory. However, it isn’t really setup to be a true directory in the broadest and most historical sense of the term. Before we dive into why we are so interested in building a cloud-based directory, we should define what we mean by a directory service. To us, a directory service is simply a system that manages the authentication, authorization, and management of users and devices to the IT resources they need. The directory service is the authoritative system to coordinate access between users and their devices to other resources. These resources could include internal applications, servers, or cloud-based systems and applications. The keys for modern organizations and their directories are the ability to manage all kinds of different user and device combinations, including Windows®, Macs®, and Linux® devices, easily authenticating with cloud-based servers (and applications), accessing networks and network infrastructure, and the ability for our customers to move more of their once ‘on-premise’ infrastructure to the cloud. With that viewpoint, the most common directories – Microsoft Active Directory and OpenLDAP – were both created in the mid-to-late ‘90s. Neither is making a smooth transition to the cloud. Organizations that we’re talking to are interested in more easily managing all of their users and infrastructure, matching up their move to cloud email (G Suite or Office 365™) for their directory, and having the ability to manage their Macs in the same manner they do their PCs. Beyond systems, IT organizations would like True Single Sign-On™ to cloud and legacy applications as well. Unfortunately, the legacy directories aren’t able to meet their needs. Setting up, hosting, and managing directory services can be complex and painful. When you throw in managing the directory software and ensuring that your authentication infrastructure is always available, it ends up consuming valuable IT resources. When you leverage a SaaS-based directory services infrastructure, it immediately takes a lot of these issues off of your plate. With a changing IT landscape, it’s critical to be able to connect your employees to the resources they need, whether that’s internal applications, cloud servers, or other devices like your employee’s Macbook. Current directories make it difficult to bridge to all of those resources. A key part of our cloud-hosted directory is the ability to connect to whatever resources your employees need access to. Ensuring that the right people have the right access is critical. The number one attack vector is a compromise of credentials. And it’s our goal to increase the security around user access. Whether that’s ensuring password complexity, implementing multi-factor authentication, controlled access, logging of user access, or any number of other mechanisms to increase security, a key part of our vision for a virtual directory service is helping blunt some of the most critical attack vectors. Over the last two decades, there has been very little innovation in the directory space. It’s been assumed that OpenLDAP and Active Directory are the core directories. However, the IT landscape around those solutions has dramatically changed. Organizations deserve a modern, cloud-based directory to meet their needs. Regardless of your needs drop us a line. Let’s discuss centralized user management, LDAP-as-a-Service, cloud RADIUS, SSO, or MFA for Macs and Linux devices. 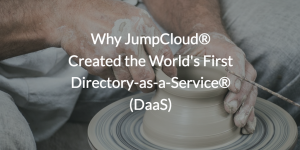 You can also sign up and try the Directory-as-a-Service platform from JumpCloud®. Your first 10 users are free forever.